I love Banana Pudding. I love it’s retro, deep south feel. I like that it’s far too sweet for its own good. It’s one of those things I have vivid memories of eating as a child, at church pot lucks, family dinners, chinese restaurant buffets (oh yes.). Its natural place in life is in a big bowl right beside the jell-o and the congealed salad. You know the one, with the pineapple chunks and marshmallows? And it doesn’t get any better than home made stove-top pudding. No instant pudding packets should be let near banana pudding, it's just not right. And it’s so easy to make it yourself, you really have no excuse. 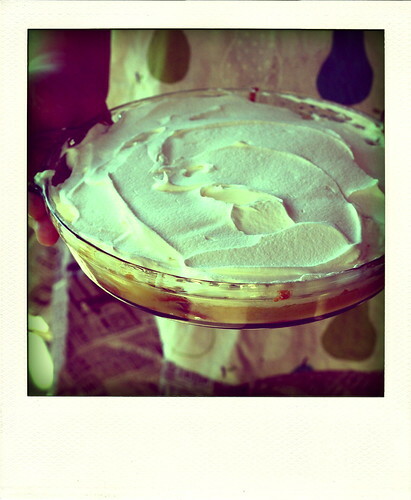 So last night, to go with our first chicken cooked on the grill of the year, I made banana pudding pie. And covered it cool-whip. It was delicious. Line the bottom and sides of a 9 inch pie plate with a layer of alternating vanilla wafers and banana slices. Place mixture over low heat and cook until thickened, stirring frequently. Remove from heat and stir in vanilla extract. 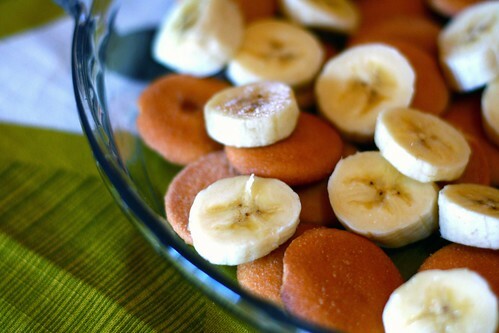 Pour half of pudding over vanilla wafer and banana layer while still hot. Bake in preheated oven for 15 minutes. Chill before serving. That just sounds so good. It looks so pretty too! Sold. I need to make. Sounds really good! About how long did it take for the sugar/flour/milk mixture to thicken once you put it on the heat? not too long, a couple of minutes, i suppose? it thickens up pretty quickly, and it doesn't have to be super thick, because you put it in the oven and that thickens it some more. Wonderful blog! Your are doing a great job with all your photos! Banana pudding is tops in my book! Have I ever told you how much I love your site?! Your photographs are amazing, as well as your thoughts. I can't wait to try this out, I've always wanted to make this classic dessert. Thanks for sharing Hannah! i love banana pudding, especially with homemade pudding. yummy! Mmm, I'm definitely making this on Sunday when my boyfriend is away from home. Then he'll come home to a wonderful surprise! :D Perfect timing because he was just talking about wanted banana pudding the other day. Omg it's been so long since I've had GOOD banana pudding! Yours looks delicious! I oughta start using my polaroid for food pictures! That banana pudding looks really good! 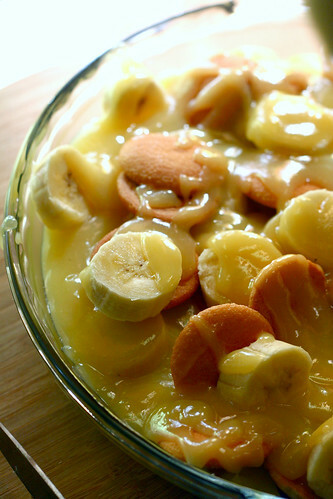 Your banana pudding looks amazing. Nice post and you've got some nice shots of your cooking/steps/food! Do you think this could be frozen? I have 3 egg yolks that need to be used so this is perfect! This looks amazing! I will have to try it. Home made pudding is the best ever! Looking delicious, My brother in law is home in another week and I think I'll make this for him. I really like this information.